Do you want to spin in the sky like trapeze performers do? You need to take an aerial yoga today! It is a beautiful type of yoga that focuses on your hips and aims at reducing joint pain, especially back pain. To perform aerial yoga, you will need a yoga hammock, which is also known as silk. It is still called silk, even though it is made with any other material. If you are confident enough to do it at home, you will need a designated area for the exercise. You do perform it in the garage, under a door frame, or even in your backyard, but only if you have a huge tree on which you can hang the hammock. Whether you plan to continue aerial yoga or not, it is an exciting form of exercise that you give a try. With that spirit, let’s move ahead and learn the different advantages of aerial yoga, different types of hammock, things to remember while purchasing one, and an all-exclusive review of five best hammocks, curated just for you. Aerial yoga can help you stay fit, and it’s not boring. What really brings about the change though is its ability to help your body develop from all angles. We will be taking a look at how you can benefit. If you recently had a baby or want to strengthen your abdominal muscles before you start gymming, aerial yoga is the most effective way to achieve that. It is a high-intensity workout that involves a lot of stretching, so if you combine it with a healthy diet, you will start losing weight quickly. People suffering from lower back pain should definitely give aerial yoga a try. When you form a yoga trapeze, you work on relaxing back muscle, which releases the pressure. Perform spinal decompression and inversion therapy to get rid of chronic neck pain. However, to prolong these positive effects, you should engage in aerial yoga regularly. Yoga, in itself, is an excellent exercise for improving flexibility and total body strength. With aerial yoga, the effects are even better. 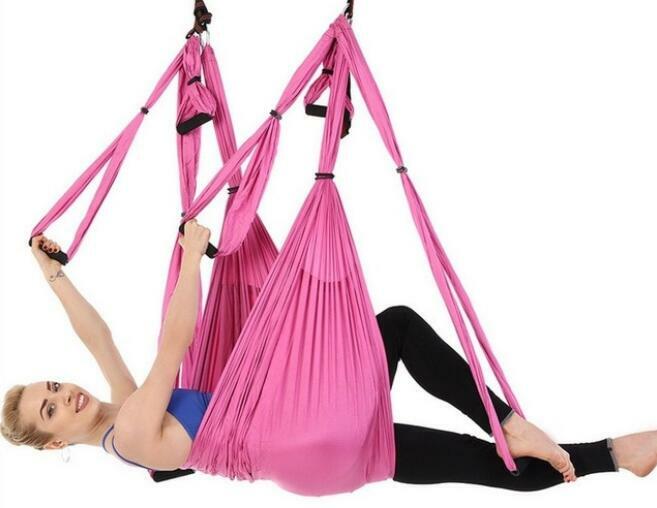 Doing the complicated backbends and abdominal workouts is easy with the hammock swing. As more muscles free up, you will start getting better at the exercises and be motivated to continue your fitness journey. Upside down therapy and spinal decompression are two amazing workouts to boost energy levels. When you are happy and energetic, you can concentrate on your work more effectively and get it done faster, so you can enjoy some me-time later. Aerial yoga is simply liberating physical. It is so comfortable that you can go to sleep while staying interlocked on the hammock. You can do spins, stretch, and relax with minimal efforts and relieve muscle tension simultaneously. One of the most important benefits of aerial yoga is that it improves blood circulation. When you hang upside down on the hammock, blood rushes you to brain and makes you feel fresh and energized. It will also help you to relieve a headache. The different movements you perform stretch your muscles and helps you in digesting food better. It increases your body’s nutrient absorbability and prevents micronutrient deficiencies. A single point is connected with the ceiling at only one point. The length of the silk depends on how tall your ceiling is and the distance between you and the hammock. Keep your hammock close to your shoulders, if you want to perform some flipping exercises. You can swing and spin on this hammock. Also known as slings, a double point hammock is connected at two places to the ceiling or attachment. Since it doesn’t swing, so it is easy to get in and out of it. It comes up to the hip height but it usually depends on the height of your ceiling or the stand. Before purchasing an aerial yoga hammock, contact the studio you plan to visit or your friend who performs aerial yoga for deciding which type you should go for. The weight capacity of the hammock should be at least 25 to 30 pounds more than your weight, so it can create sufficient tension. Your safety and security should be your major concern, so don’t compromise and buy a cheaper hammock that cannot handle your weight. If you go to a yoga studio for performing aerial yoga or travel regularly, you should look for a hammock that folds up neatly and can be stored in a bag. Another important component is portability is durability, so it withstands your travel schedule. Hammocks are available in a variety of sizes because every person is of different height. A simple way to find the correct one for you is to measure your height and length from one hand’s end to another. Now multiply these numbers by two and that’s the size you should be looking for. The lighter the hammock, the easier it will be for you to perform different exercise and positions. When silk is lightweight, it is automatically less bulky, so you can carry it around easily. This is self-explanatory. Some hammocks are complicated and will give you a hard time while setting it up on the ceiling or the stand. A good warranty policy indicates that the product is of high quality and will last you for a long time. Choose a hammock that offers at least a year’s warranty. More the warranty period, pricer the hammock would be. Look for hammocks constructed using durable and strong parachute fabric. It is not only long lasting but also heavy duty. It is slightly uncomfortable but once you get a hang of using it, you will enjoy performing aerial yoga. The material doesn’t stretch, so if you want something that stretches, purchase a silk hammock. It will be more expensive and not as durable. Making sure you are 100 per cent safe is the key to enjoying an aerial yoga hammock. You don’t want to attempt a swing and fall on your nose and break a bone. Read the manual and safety instructions that come with the hammock. If you are using a separate bar for hanging the fabric, it should be at least 4 x 4” thick. 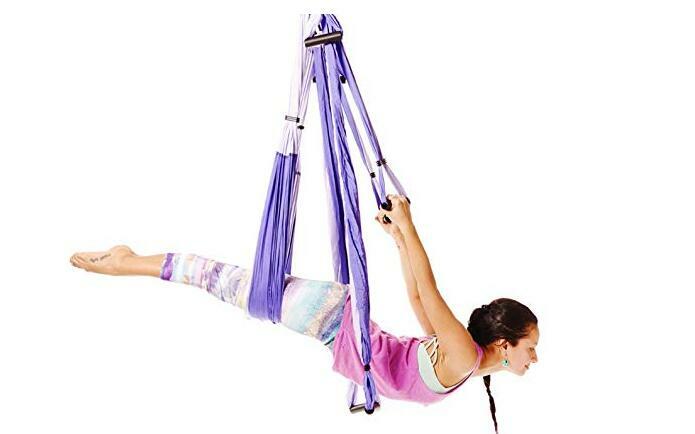 It is important to invest in good quality and durable aerial yoga equipment for your peace of mind and security. Don’t pay attention to the price tag because you won’t be thinking about it when you are suspended in the air. Here are five of the best aerial yoga hammocks that are amazing for beginners as well as trained professionals. Perfect for performing inversion therapy, Yogabody Yoga Swing helps you create immediate traction, so you can develop natural gaps between your vertebrae. It has been tested to bear up 600 lbs of weight, making it one of the strongest hammocks in the market. 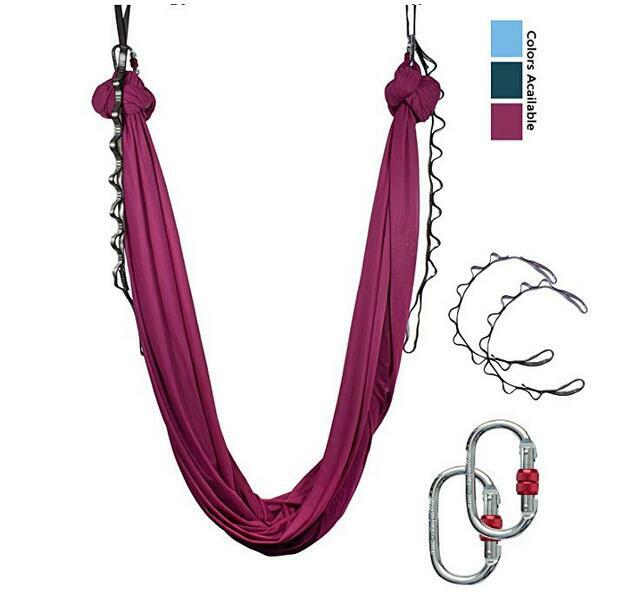 Easy to set up and carry about, the hammock comes with several gym-grade grip rubber handles, two climber-strength knotted ropes, rock-climber grade carabiners on a sling, and one drawstring bag. It is constructed using parachute nylon material, which imparts the model its strength and durability. You can set it up at home, on a trapeze, or on a strong tree branch. Yogabody Yoga Swing can hold multiple yoga backbend poses and free up muscle tension in the mid and upper back area. You will get a 10 years parts warranty on the product, which means Yogabody will replace the hammock if you experience any mechanical difficulties. 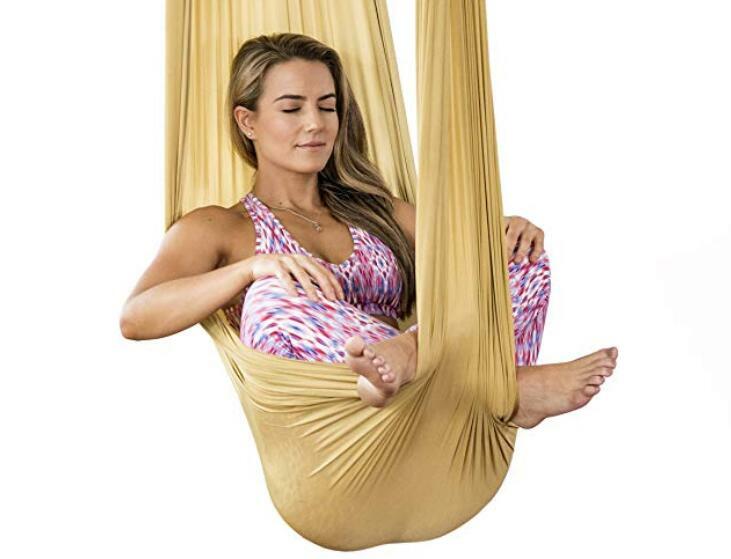 A beautiful golden silk product, Healthy Model Life Silk Aerial Yoga Swing & Hammock is affordable and durable. You don’t need to purchase hardware separately as all is included in the price you pay. It has a daisy chain hanging system, so you can hang it on a bar, concrete beam, or solid pipe. This swing isn’t made for concrete ceilings. The superior quality material supports you to swing, spin, and transition between different poses smoothly. It doesn’t have any handles, which takes away the ugliness that other hammocks have. After you are done with aerial yoga, you can turn it into a standard hammock, lie back and relax, and meditate. The only downfall of this swing by Healthy Model Life is that it only comes with a one-year long warranty, which is too less compared to others on our list. UpCircleSeven Aerial Yoga Swing Set is available in five different colors including black, blue, orange, purple, and turquoise. The large and comfortable padding supports your back while you transition into different poses. 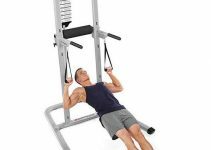 The triple stitched swing seat keeps you comfortable while you push your limits and try new positions. It is a wonderful swing for spinal decompression and improving upper body strength. You will get two iron-clad multi-loop climber strength daisy chains in the package. Each of the chains can bear up to 200 lbs of weight. It is a basic swing set that is a great choice for beginners and children. Other accessories like handles and grips aren’t included in the package, so you will have to purchase them separately. You will get a free Yoga Swing Guide with the swing set, so you can learn therapies step by step. Known for its premium quality and strength, F Life Aerial Silks Equipment is constructed using 100 per cent Nylon Denier Tricot weave fabric. You can purchase it in a large variety of colors. Some of the popular choices include aqua, black, blue, and blush pink. You can also try your hands on other color options like burgundy, dark blue, dark purple, gold, and lake blue. It is the longest aerial yoga hammock you will ever find as it is 30 feet in length and 108 inches wide. When hanging from a ceiling, it is 14.5 feet on each side. It is also one of the strongest hammocks you will ever find as it has a maximum weight bearing capacity of 1,000 lbs. The product has certified high strength hardware rigging including one steel screw-lock carabiners, one mountaineering swivel, one rescue 8 / descender, and a carry bag. It comes with a one-year warranty and is worth every dollar you pay. 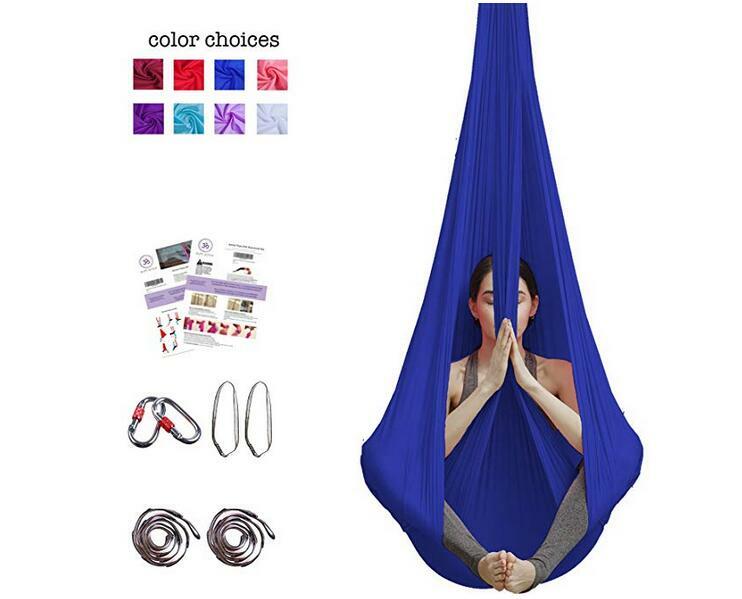 Aum Active Aerial Yoga Hammock is a super soft and stretchy product that is available in multiple colors including navy, white, pink, lavender, royal purple, red, light blue, teal, orange, plum, gold, and hot pink. It is 13 feet long and nine feet wide, so you have enough fabric to hold and change positions. When you hang it on the chains, it hangs 11 feet on either side. Carabiners and daisy chains are included in the package but no mounting rig, which you will have to purchase separately. You will get a two-page guide along with the hammock, which can get you started with the basic poses. It is wonderful aerial yoga hammock for spinal decompression and upside down therapy. It has a maximum weight bearing capacity of 500 lbs, so you don’t have to worry about your safety and comfort. You will get one year warranty on the product. 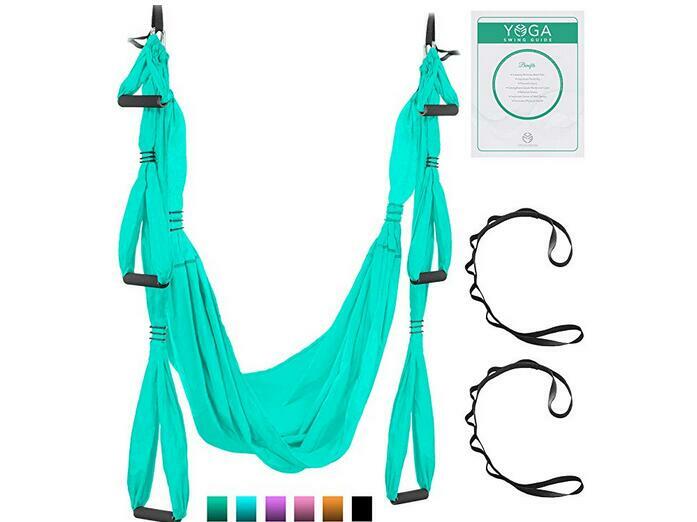 After reviewing all five products, we have a winner and it is the Yogabody Yoga Swing. It is made using the most durable parachute nylon, which is strong and holds weight well. It isn’t too expensive and comes with a long 10 years warranty, which proves its superior quality. All parts including the handles and daisy chains come along with the product. Also, it can bear up to 600 lbs of weight, so everyone can use it with ease.